Borussia Dortmund brought up a landmark 500th home Bundesliga win in the club’s history on Matchday 22 of 2017/18, underlining the fortress-like nature BVB’s homes have had for the club down the years. Hamburg – a club who have visited the venue more than many over the past 44 years – found no antidote for the affliction which strikes the majority of its guests, going down 2-0 and into record books as the 500th visiting team to leave Dortmund with nothing. It made BVB just the fifth club in Bundesliga history to reach that landmark victory (after Bayern Munich, Werder Bremen, Hamburg and VfB Stuttgart), confirming their status as one of the toughest teams to beat on their own turf. Their current home, the Signal Iduna Park, is synonymous with both Borussia and German football as a whole. The buzz from Europe's biggest average crowd, at more than 81,000 a shot, emits a constant, never-sated hunger for seeing opposing teams put to the sword in spectacular fashion every home game. 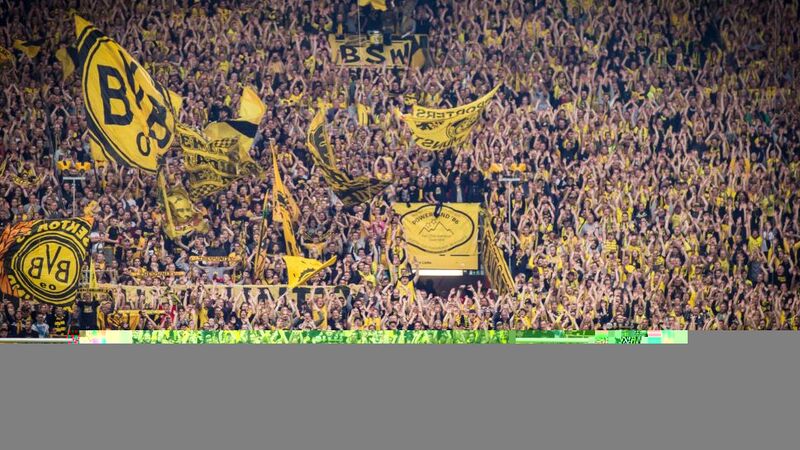 So vocal is the support, and not just from the imposing 'Yellow Wall' – Europe’s largest standing terrace at almost 25,000 – that Borussia not only have a 12th but even a 13th man in the stands, pushing the team to win after win; three points after three points. The statistics don’t lie either: Only Bayern can claim to have a better record of winning at home than Borussia’s 58 per cent of Bundesliga games. Their 3-2 loss to RB Leipzig in October 2017 was their first in the league at the Signal Iduna Park in 30 months. Opposing teams arrive with a nagging feeling of dread in their stomachs, pre-match butterflies fluttering less than merrily. Most have left as sick as the proverbial parrot having been stung several times by the busy and supremely talented black-and-yellow bees. There are many fans out there who won’t remember a time before Dortmund played at their Westfalenstadion. The club moved into their new home in 1974 just months ahead of the FIFA World Cup hosted in West Germany. Although, the stadium with the record for Europe’s largest fan attendance almost never was. When plans were drawn up for a new ground for BVB back in the 1960s, the city of Dortmund was unable to afford such a project. Borussia in fact owe their record-breaking home to the city of Cologne, who were due to host a World Cup match in 1974 but withdrew after costs their spiralled. Dortmund was therefore chosen as the replacement and was re-allocated Cologne’s funds. Construction on the 54,000-capacity Westfalenstadion began in 1971 alongside the club’s then home of the Stadion Rote Erde, where BVB had played since 1926 and in fact have a better win percentage in the Bundesliga (60%). However, since the arrival of Jürgen Klopp in 2008, Dortmund have upped their winning rate at home to a formidable 65 per cent, losing just 21 times in 164 game up until that victory over Hamburg. "We want to make this stadium a fortress," said Klopp’s successor in the Dortmund dug-out Thomas Tuchel, and he succeeded in that undertaking by not tasting defeat in the Bundesliga once and witnessing his team outscoring opponents 90 to 22 in two years of residence at the Signal Iduna Park. "We want to give our opponents stomach aches,” he added. A total of 500 cases of stomach problems have now been recorded by visiting teams in Dortmund. Something in the water? Or a black-and-yellow influenza?